This entry was posted in News Items on May 10, 2015 by admin. Our AGM was held in the Bell & Steelyard, Woodbridge on 10th March and after the meeting we were entertained with an excellent video about the fantastic work of the RNLI and some heart rending stories about real life rescues. At the AGM we bid farewell to some of our outgoing members and welcomed a new committee member to the team, Chris Annett. This entry was posted in News Items on March 16, 2015 by admin. This entry was posted in News Items on February 2, 2015 by admin. • Tombola, treasure hunt etc. • Would you like to have a table to sell surplus yachting gear – or anything else? Please contact secretary@hpyc.com or gillhm@hotmail.co.uk for more information or how to get involved. This entry was posted in News Items on October 19, 2014 by admin. After 3 days, 48 miles, and over 20 hours rowing, we arrived at Woodbridge bang on schedule for the Maritime Festival. We rowed on 3 local rivers: the Stour, the Orwell, and the Deben with stops at Harwich, Shotley, Ipswich, Felixstowe, Ramsholt, Waldringfield and finally Woodbridge. A huge thank you to everyone who kindly gave donations to make it all worthwhile and particularly to those who came along to Woodbridge to welcome us home. If you haven’t yet made a donation and would like to do so then it’s not too late. Here is a link to our Just Giving page. And for more details and pictures you can follow us on Facebook and Twitter. This entry was posted in News Items on September 20, 2014 by admin. On 12th, 13th and 14th September members of RNLI Woodbridge Branch (and friends!) will be rowing the William Riley lifeboat on the Stour, Orwell and Deben to raise money for the RNLI. The William Riley is a 105 year old lifeboat, which famously tried to rescue passengers from the Rohilla when she ran aground off Whitby 100 years ago – it was recently featured on the BBC programme Coast. There will be ten rowers, two linesmen, one helm and three passengers. Suffolk Yacht Harbour, Levington, have kindly offered to act as hosts so each day will begin and end there. This is the intended itinerary (weather dependent), there will be some great opportunities for photographs with the William Riley and the current Harwich lifeboats and there be fundraising along the way. You can follow us on Facebook and Twitter and give donations online at our Just Giving page. This entry was posted in News Items on August 6, 2014 by admin. 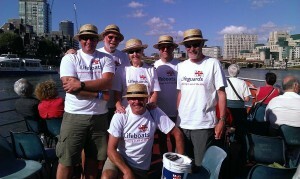 ‘3 Men in a Boat’ row down the Thames – they did it! 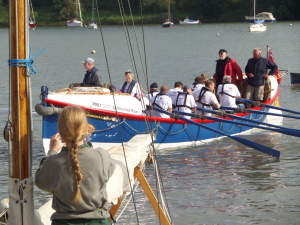 Tony Wilman, Chairman of the RNLI Woodbridge branch, decided earlier in the year that to mark the 125th anniversary of Jerome K Jerome’s book 3 Men in a Boat, he would try and get a team together to follow in George, Harris, Jerome (& Montmorency’s) footsteps to recreate the route taken by “3 Men in a Boat”. He and two friends had completed the journey five years ago and decided this time to raise sponsorship for the RNLI. 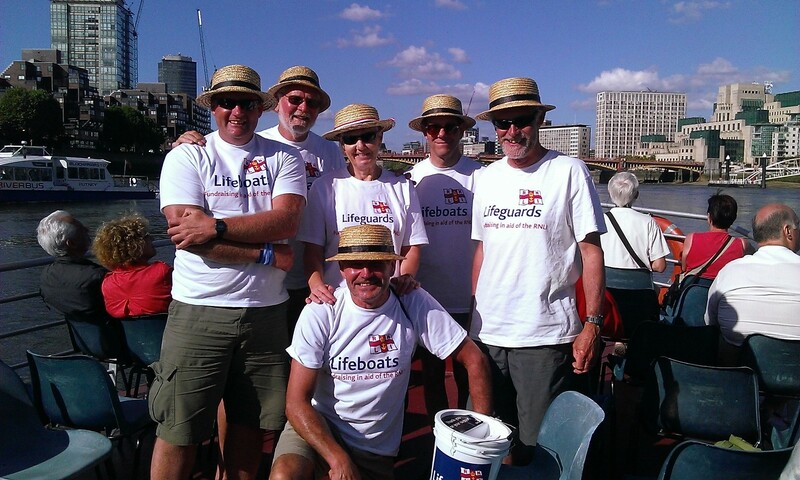 There were 5 volunteers – Peter Haffenden and Jason Banham who have rowed with Tony for many years would be in one boat and Tony Allwood, Julian & Cathie Taylor in another, all of whom have considerable experience on the water. They set off on Tuesday 3rd June from Woodbridge to Lechlade for a journey that would see them cover 140 miles of the River Thames in 8 days and going through 46 locks. They hired the skiffs which came with a tent cover for the boat and basic cooking facilities and took another tent for the 3rd person on each vessel. Instead of heading down river at Lechlade they headed for the round house which is the official start of the navigable Thames. They then turned down river and started their adventure which would end at Richmond Lock, the end of the non tidal Thames. The rowers were invited to attend Beale Park which sits on a 7 acre lake, in time for the Beale Park Boat and Outdoor Show where they were featured in the programme and gave a demonstration on the water with the help of a lady who was on the RNLI stand. There was such interest in the skiffs and the cause that they managed to raise over £150 on this day alone. This entry was posted in News Items on June 23, 2014 by admin. 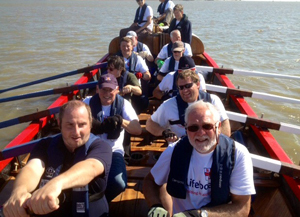 From 2nd June – 10th June, 6 volunteers from the RNLI Woodbridge and District will be rowing from Lechlade to Richmond to mark the 125th anniversary of Jerome K Jerome’s famous book “3 Men in a Boat”. 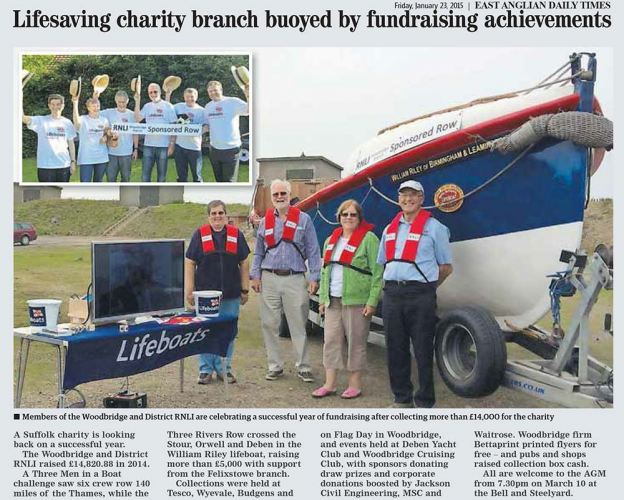 The 6 rowers (3 in each boat) are raising money for the RNLI Woodbridge and District Branch. This entry was posted in News Items on May 7, 2014 by admin. Our AGM was held in the Bell & Steelyard, Woodbridge on 27th March and after the meeting we were entertained with an excellent talk/presentation given by Anthony Mason, our Branch Talks Officer. A new committee was elected and we now have a new Chairman, Tony Wilman, a new Box Secretary, Alan Whitfield, and a new PRO, Caroline Wilman. As well as Caroline, we also welcomed new committee members, Shona Hardie and Peter Haffenden. A huge thanks to our outgoing Chairman, Len Graves, for all the hard work he has put in over the last 2 years – he has made a big difference to the Branch. Happily, Len is continuing on the committee. This entry was posted in News Items on March 30, 2014 by admin. This entry was posted in News Items on January 13, 2014 by admin.